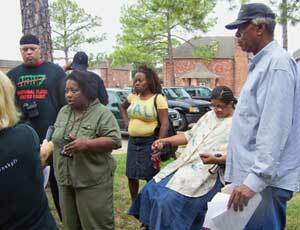 Houston – Four years after Hurricane Katrina hit New Orleans, survivors living in Houston are still fighting to keep a roof over their heads. Three women spoke recently at a news conference at the Kensington Club II townhome apartments to expose the owner’s corruption and the squalid living conditions he allows. The news conference was organized by Lenwood Johnson, a housing advocate with the Freedmen’s Neighborhood Association. Johnson explained that the Kensington Club II owner is accepting Disaster Housing Assistance Program vouchers from the Federal Emergency Management Agency — yet is not crediting all of the renters’ accounts as being paid. Kofi Taharka, president of the National Black United Front and a representative of the International Action Center, also spoke. Then residents Eugenia Brown, Quinna Brown and Jennifer Whittington addressed reporters. Whittington, who is severely disabled with arthritis and also has cancer, cannot work. She said she was depending on DHAP to contribute to her rent but, after complaining about conditions, she received an eviction notice. Eugenia Brown, who suffers from asthma, later showed reporters the mold growing in her apartment, as well as leaking ceilings and pipes. Volunteer movers were packing her belongings in a moving van as she spoke. Yet with nowhere to move to, Brown put her things in storage; for now she is staying with various friends. Quinna Brown also allowed reporters into her apartment—which had mold, water stains, appliances that did not work, light fixtures falling from the ceiling and leaking pipes. She was in tears as she spoke. “I work at Wendy’s and am trying to keep a home for my 11-year-old daughter, yet the Disaster Housing Assistance Program is not paying the money it is receiving from HUD to the apartment owner,” she told reporters. Brown was trembling and sobbing as said she was about to totally fall apart over losing her home. Because these women had complained to the owner about the unsafe conditions, he was evicting them rather than make required repairs. A week after the news conference, Whittington was looking for a shelter to move to, even though she is still appealing her eviction orders and is in her apartment. “Men with guns keep coming to my apartment and threatening and intimidating me,” she told Johnson. “They are from the constable’s office and I am afraid.” Lenwood Johnson is helping her find a shelter to move to. © 2009 Workers World. This story was originally published Sept. 11, 2009, by Workers World, 55 W. 17th St., New York NY 10011, ww@workers.org, www.workers.org, at http://www.workers.org/2009/us/katrina_0917/index.html. The writer spoke on behalf of the International Action Center.